Monstrumology is the science of dissecting truth from superstition — or debunking myths altogether. In The Curse of the Wendigo, it specifically involves understanding and maintaining humanity in a world of monsters. I really liked The Monstrumologist, Rick Yancey’s first book in the series, when I read it last year, and I’m ashamed it took me this long to pick up the sequel. It was, most assuredly, well worth the wait. I’m only saddened to learn that after the next book, The Isle of Blood, there’s just one more (The Final Descent releases in September). Of course, a fourth book almost didn’t happen at all. These novels follow the life of young Will Henry, an orphan and apprentice (and often caretaker) to the eccentric, brilliant, and occasionally unstable monstrumologist Dr. Pellinore Warthrop. 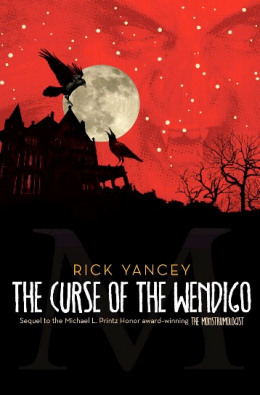 I admired Yancey’s talent for the grotesque in the first book, in which the pair hunted the Anthropophagi, but The Curse of the Wendigo‘s particular accomplishment comes from how it manages to instill fear and trepidation without confirming the existence of a monster at all. Whether the Wendigo — a being that always hungers, that kills until it’s killed and calls your name on the high wind, marking you as its victim with its penetrating yellow eye and irresistible lure of desire — is real or myth, Yancey never answers. The question alone is what forces the characters to look deep within themselves and determine whether man is capable of becoming such a horrible monster or whether we make up stories about evil creatures to comfort and shield ourselves from the truth. When we cannot say for certain, is it easier to save a madman or destroy a beast? The Curse of the Wendigo is equally as horrifying in its descriptions as its implications. Yancey tells of watchful eyes among dark trees; of bodies impaled high up, their rib cages and hearts torn open; skin peeled off and faces removed; mounds and mires of defecation and stink; and of wordless death cries from the old and young and newborn. He also shows us human beauty — of love and devotion, both romantic and that of a parent and child, and of great sacrifice to save another. It’s a much more internal story than The Monstrumologist was, and darker, too. But it’s less action-packed. Half takes place in the wilderness, far from home, and the rest — largely the tale of the deteriorating state of a sick man, Warthrop’s best friend and also the person who stole away the woman he loved — returns the travelers to their residence in New York. The future of Will Henry and Warthrop is much more uncertain by the end; the book more closely explores their relationship and interdependency and what consequences that has. I’m curious to see what happens next. I think I’ll be reading the next book a lot sooner.